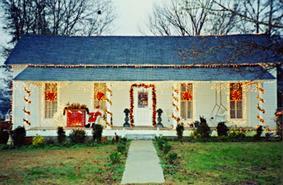 Holidays have always been special in Holcomb. 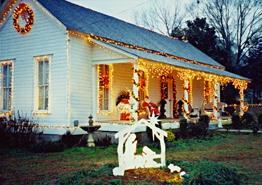 Gary and Cletia Clanton share the season at the Clark-Jackson-Oakley home (above and below) in Block G facing Williams Street/Sparta Road. The Cecil Jacks home in Block C facing Paschal Street. The home of J. Roland and Thelma Hill in Block 8 facing Paschal Street. This house in Block 8 facing Paschal Street was home to the family of "Bud" Minyard, Gladys and J.P. White and Bena White. Carmel and Mary Ella Norris lived in this home in Block 9 facing Tuscahoma Street. The families of C.C. "Foots" Clark, D.K. Hayden and Ward DeLoach lived in this home on Williams Street/Sparta Road. The Hye-Townsend-Knights-R.L. Harris home is in Block 12 facing Tuscahoma Street. The home of Tommy and Ester Faye Jackson is in Block 8 facing Paschal Street. The Payne home is in Block B facing Tuscahoma Street. Copyright © 1995-2013 www.Buckhead, inc. All rights reserved.